The 4x4s and 4x6s you use — do you just drive right up on them or have you ramped them? 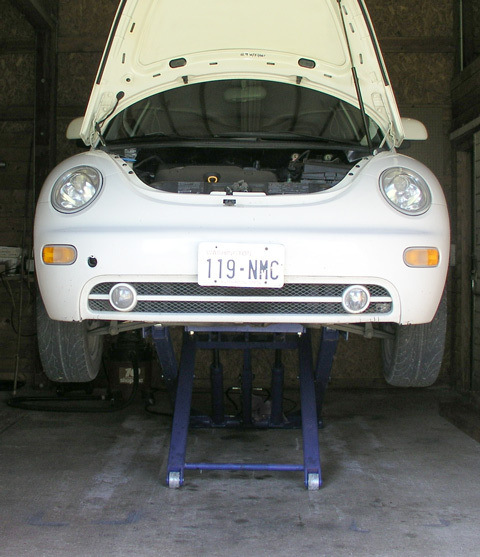 I’m familiar with the concept as I use a pair of 1x6s stacked on each side to raise the Jensen-Healey enough that I can just barely slide my floor jack under the front cross member. 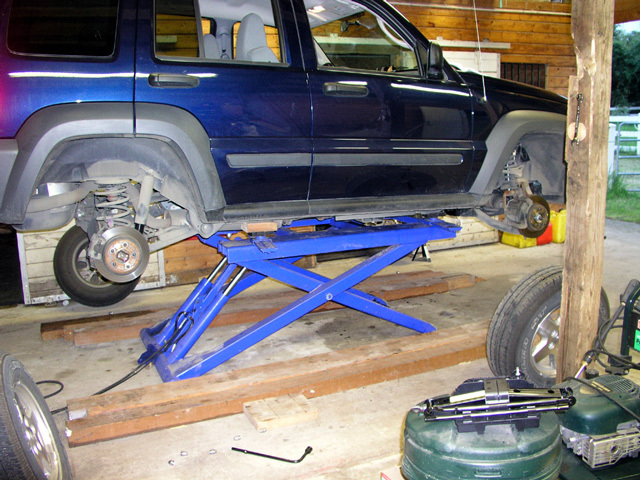 Just looked at harbor freight dot com and saw your lift at $949. 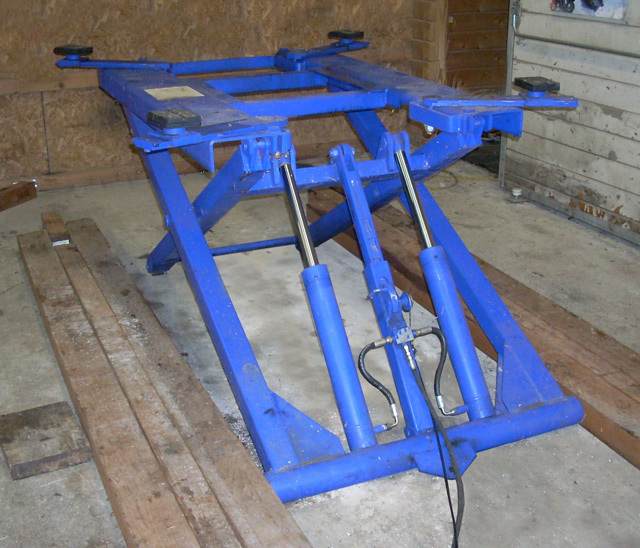 There’s another 6,000 pound lift for 1999.99, item number 98168. I wonder what the extra kilobuck buys you? Hi Sandro. Close observation of the last three photos shows the evolution of the “lumber lifts”. First I used just 4×4’s and some short 2×4’s to ‘step up’. Now I have four 4×6’s with two longer 4×4’s that I insert between a the pairs of 4×6’s. 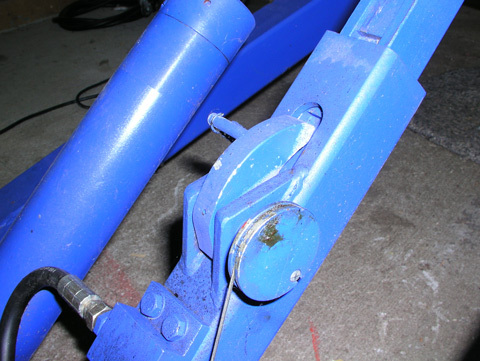 The ends of the 4×4’s are cut into wedge/ramps. The full 14″ or so width of the total lumber allows me to be pretty casual about positioning. For the Jaguar the clearance is still very tight to the exhaust (E-type exhausts are VERY low), especially as the jacking points on an E-type are odd, so that the front arms of the lift are fully forward. 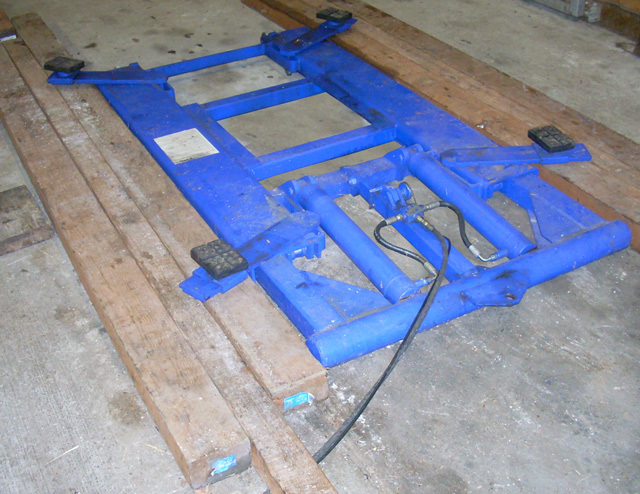 I use three 4x4s cut to short (12″) lengths as dunnage to sit between the Jaguar and the lift points. 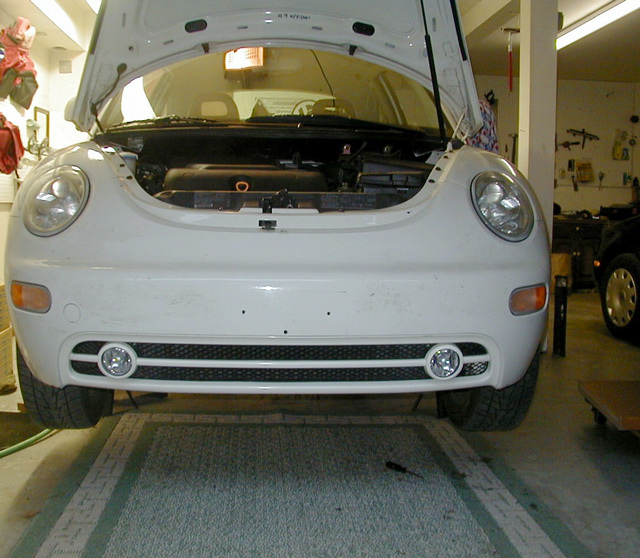 Even then you can barely fit a hand between the exhaust and the main body of the lift. 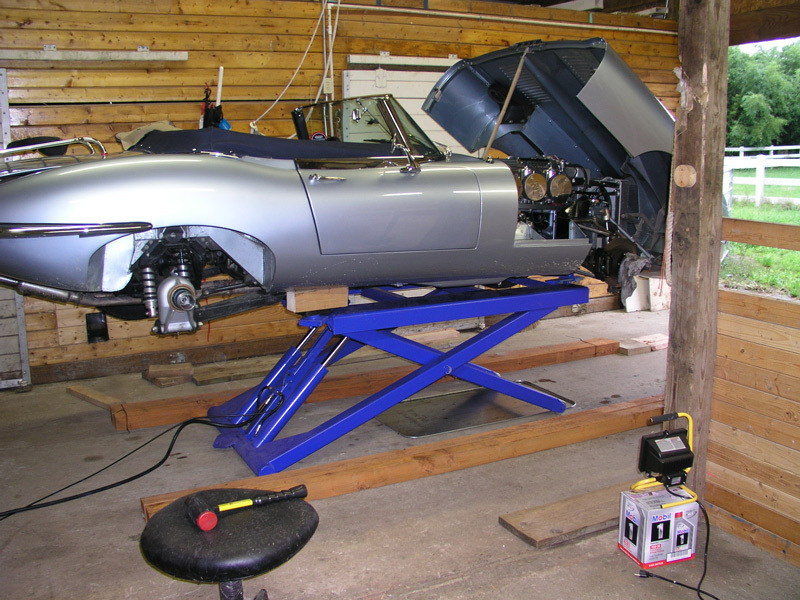 The only time I bring out my jack-stands anymore is to support the Jag’s IRS when it is off the ground (it isn’t wise to leave it unsupported for long) and of course when I replaced the Jag’s exhaust system. 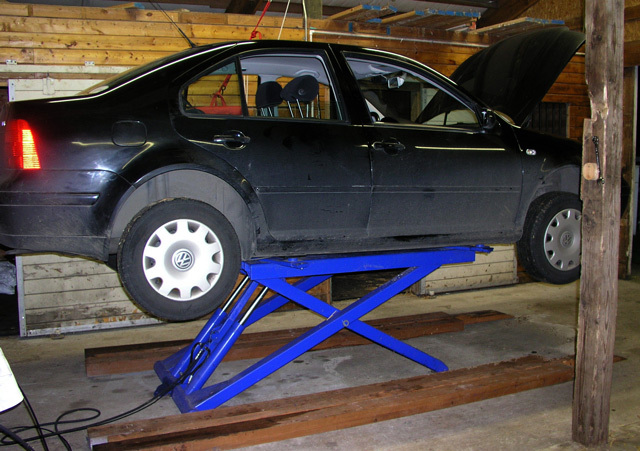 For that I used the lift to raise it, then setup the jack-stands, then lowered the lift leaving the car in the air. Worked pretty well. Interesting John. It appears that the one I have seems to be an amalgam of both. 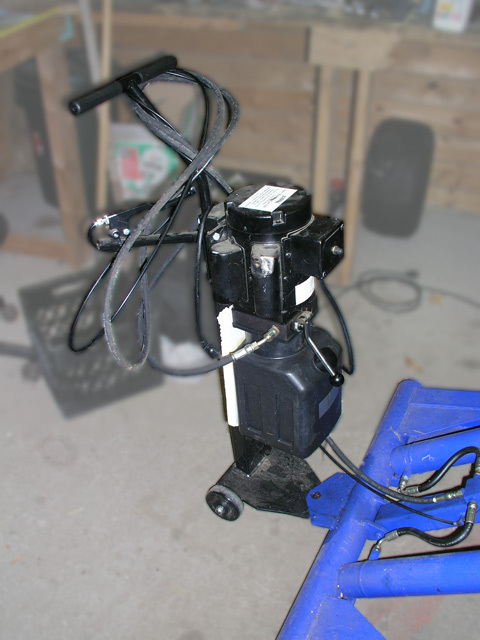 The cheap one (with my item#) no longer has the lever/control cart anymore. It also seems to run only on 220V power. Other than that, they seem identical. In other eerie news, that item number is my office’s ZIP code. Road & Track can’t be too far off in your future, buddy!